We’d love your help. 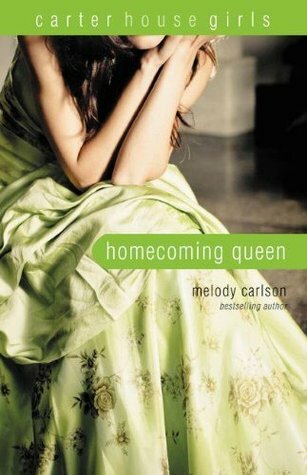 Let us know what’s wrong with this preview of Homecoming Queen by Melody Carlson. With six teenage girls living under one roof, things are bound to get interesting. Mix six teenaged girls and one 60s fashion icon (retired, of course) in an old Victorian-era boarding home. Add guys and dating, a little high-school angst, and throw in a Kate Spade bag or two and you ve got The Carter House Girls, Melody Carlson s new chick lit series for young adults! The With six teenage girls living under one roof, things are bound to get interesting. Mix six teenaged girls and one 60s fashion icon (retired, of course) in an old Victorian-era boarding home. Add guys and dating, a little high-school angst, and throw in a Kate Spade bag or two and you ve got The Carter House Girls, Melody Carlson s new chick lit series for young adults! The Carter House experiences a shake-up as one of its own returns home after an unnerving disappearing act. Then, friction grows as a school Homecoming Queen race heats up, turning friends and housemates against one another. DJ, Eliza, Taylor, Kriti, Rhiannon, and Casey show they have plenty of lessons to learn as the votes roll in. Some grow smarter and closer to God, while others seem to make the same mistakes over again. Despite all their differences and disagreements, the Carter House girls continue to grow together, forging a bond that strengthens through hardship. Hearts CAN change and friendship paves the way for at least one girl to move closer to God. To ask other readers questions about Homecoming Queen, please sign up. Spiritual Content- Prayers; Talks about God & a God-thing; ‘H’s are not capital when referring to God; DJ is still a new Christian and has some doubts; Taylor mentions that her grandmother is a real church-going lady; A guy says he’s an atheist; Mentions of prayers working; Mentions of youth group & church going. *Note: Mention of designers & celebrities; Mentions of Starbucks; Many mentions of pig’s blood and the movie Carrie. *Notes: DJ wears a bikini to the pool & boys whistle; A mention of a lacy bra & mini-skirts; A mention of seeing another girl naked; A mention of tampons; A couple mentions of the boys’ locker room; Mentions of eating disorders. While this one was cleaner than the last one (Sexual Content wise), I wasn’t a fan of all the mentions of the pig’s blood…that is just gross! This series definitely gets better as it continues, though, the thing is you just have to get there. More angst and drama, but I’m liking the characters a lot more. Except the grandmother, who seems like the worst guardian ever. She doesn’t really pay any attention to what the girls in her care are doing. Oh, and I don’t like Conner that much, especially in this one. I feel like the back cover description is kind of deceiving. Sure, there was the homecoming queen thing, but I think the real focus of the story isn't even mentioned on the back cover. I also don't see the girls growing much closer, and I definitely don't remember anything paving the way for one girl to move closer to God. I'm so annoyed with this series. I don't really like it very much, I'm annoyed with the characters, annoyed with the writing, but I'm interested enough to want to see where it I feel like the back cover description is kind of deceiving. Sure, there was the homecoming queen thing, but I think the real focus of the story isn't even mentioned on the back cover. I also don't see the girls growing much closer, and I definitely don't remember anything paving the way for one girl to move closer to God. I'm so annoyed with this series. I don't really like it very much, I'm annoyed with the characters, annoyed with the writing, but I'm interested enough to want to see where it all goes. Which makes me want to read more. But I don't want to want to read more! Why must authors torment me so? I'm tired of all the manufactured drama, but somehow I find myself still caring about what happens. This was the third book in the Carter House Girls, an entertaining series of Christian YA novels, which I actually bought for 2 dollars on Kindle because I enjoyed reading the first book so much. Like the first two novels, this one was also well written, and I enjoyed seeing how the characters were developing. I am so glad I started this cute series. I love this series. There are so many characters. There are girls you just love to hate, ones that you can really relate too, with situations that make you laugh and others that can break your heart. The way the series is written you get to the end of one book and can't wait to start the next one. Ok it does get on my nerves how they treat Taylor but I’m really glad I found a series. I am still enjoying the series. This book was not all that I expected it to be. I felt highly annoyed with all the characters in the book. The story is about a group of teenage girls living in the same household, but each go through an obstacles as the race of Homecoming queen heats up. The characters DJ, Eliza, Taylor, Kriti, Rhiannon, and Casey are all facing problems that they have to learn to deal about what is going on within their lives. This is all happening when the votes for Homecoming queen are taking place. I often This book was not all that I expected it to be. I felt highly annoyed with all the characters in the book. The story is about a group of teenage girls living in the same household, but each go through an obstacles as the race of Homecoming queen heats up. The characters DJ, Eliza, Taylor, Kriti, Rhiannon, and Casey are all facing problems that they have to learn to deal about what is going on within their lives. This is all happening when the votes for Homecoming queen are taking place. I often saw throughout the book, that while the girls were learning and dealing with all what is going on with their lives, some just lived the same life and they didn't really learn from their mistakes. Later on reading in the book, I noticed that they grew with this close bonding relationship and it made all six of those girls a lot more closer. The whole story is surrounded by this whole spiritual theme. The girls are trying to get closer to god. That is what makes Melody Carlson a great writer because she makes her books towards a specific audience, and she connects it with spirituality. Worst Part: Too much fashion! Thoughts Had: Shut up please! ; Who cares! ; Get over it! Short Review: Okay, i'm not 100% there was a solid plot to this book. This series is for sure meant for maybe 13yr olds going into middle school. I still can't handle the southern accent. All the mainly talked about for awhile was clothes. Gag. Homecoming Queen seems like a novel that would be about the race for homecoming queen. Fortunately there is some action and surprises that are not expected. This book might not relate as many readers, but it does keep your attention. I really enjoyed this book's unexpected turns. The title is a little misleading because the homecoming race is not the main focus of the book. I like how this book flows right from the first and second books in this series. There is no jumping around and confusion Homecoming Queen seems like a novel that would be about the race for homecoming queen. Fortunately there is some action and surprises that are not expected. This book might not relate as many readers, but it does keep your attention. I really enjoyed this book's unexpected turns. The title is a little misleading because the homecoming race is not the main focus of the book. I like how this book flows right from the first and second books in this series. There is no jumping around and confusion. I like how there are more surprises and you can't just guess what will happen. The only thing I did not like was how the plot line was all over the place. It did keep the story exciting though. The story of the Carter House girls continues as the school year goes on and the girls struggle in their relationships with each other. The main drama in this book centers around homecoming. Both Eliza and Taylor are running for Homecoming Queen so the house is split in their loyalties. DJ and Taylor continue to room together and DJ starts to see Taylor's true colours and not just the tough exterior she portrays. In this book, the focus is back on DJ. She becomes a hero because of her split seco The story of the Carter House girls continues as the school year goes on and the girls struggle in their relationships with each other. The main drama in this book centers around homecoming. Both Eliza and Taylor are running for Homecoming Queen so the house is split in their loyalties. DJ and Taylor continue to room together and DJ starts to see Taylor's true colours and not just the tough exterior she portrays. In this book, the focus is back on DJ. She becomes a hero because of her split second reflexes, but pays the price with a broken leg and ribs. As she struggles to come back from her injuries, she questions her trust in Connor and also suspects one of the girls in the house is stealing her painkillers. This is a great series so far - really good story, great characters with a lot of variety in the personality department; and good development (I'm starting to find myself really liking the "wrong" characters!). The only thing that irritates me is DJ and Rhiannon's (love that name!) passivity in their relationships with God. It just seems to me that He should be more of a focus in their lives. But that's not a huge issue; just something that kind of niggles at me, probably because of some of the This is a great series so far - really good story, great characters with a lot of variety in the personality department; and good development (I'm starting to find myself really liking the "wrong" characters!). The only thing that irritates me is DJ and Rhiannon's (love that name!) passivity in their relationships with God. It just seems to me that He should be more of a focus in their lives. But that's not a huge issue; just something that kind of niggles at me, probably because of some of the other books i've been reading recently. This series has done a marvelous job of keeping me entertained and reaching for the next book. I find some of the characters annoying, but not so much that they spoil the rest of the story for me. I just wish they could look at themselves in the mirror and see how negative and selfish their actions are. This book was just as exciting as the others and there is always some sort of drama to keep all the girls on their toes. I'd recommend. *Taken from my book reviews blog: http://reviewsatmse.blogsp This series has done a marvelous job of keeping me entertained and reaching for the next book. I find some of the characters annoying, but not so much that they spoil the rest of the story for me. I just wish they could look at themselves in the mirror and see how negative and selfish their actions are. This book was just as exciting as the others and there is always some sort of drama to keep all the girls on their toes. I'd recommend. These get better with each book, but I'm just not sure how I feel about these girls yet. DJ being friends with Conner's ex was a bit ridiculous, especially after it became clear she wanted Conner back. Girls just don't do that. The whole pill thing was interesting, though, mainly because it gave Casey some background. I wish the books would focus more on Kriti, someone who has barely been mentioned at all, instead of Taylor. This book is ok, but it wasn't better then the second one. I felt that DJ was very whiny about her life which was very annoying because that was about the majority of the book. Her grandmother still irritates me. The fact that everyone still hates Taylor is getting old. I also felt like the ending was very rushed. Which I didn't like when the rest of the book was very slow. This book wasn't my favorite. DJ was very whiney in this book and it still sends the message that if you just pray you will get what you want. Any Christian knows that this is not true. I am not a huge fan of this aspect of the book, but like all the other books the end pulled me back in and made me want to read the next book in the series. The carter house experiences a shake-up as one of its own returns home after an unnerving disappearing act. Dj, Eliza , Taylor , Kriti , Rhiannon, and Casey show that they have plenty of lessons to learn as the homecoming queen votes roll in. Some grow closer to God, others make the same mistakes over again. This book wasn't what I expected it to be. I figured it would be more about the homecoming dance and the fights between Eliza and Taylor. I'm kind of disappointed in the way Eliza's character shaped out. I know it becomes a better story with a mean girl, but why not make it Madison or someone on the outside. I really enjoy the way Melody incorporates Jesus and Christianity in the books. Meh - it was alright. Another basic formula like the other ones in this series so far. I don't know why I keep reading them. I guess just to see what happens to the characters and if the story will get any better. I just can't believe that this usually awesome author would turn out these half-baked books. I liked this book a lot, and the only raeason it took more than one day to read is because I've been busy! The plot moved quickly and I didn't think it was too obvious, but then again, nothing seems too obvious to me. I tend to be easy to please. A fun fast read with an ending I was pleased with. This book is sooo good! I am almost finished. There is some suggestible stuff mentioned, but it's from a Biblical point of view-sometimes. But it is still really good. These are like those TV shows you binge watch. Start with one and before you know it you have finished the series. I liked this book because DJ tries to save a little boy and teaches the other girls not to be sos selfish. Having not read the first two books, I was quite hesitant to read this at first. Apparently, it's an easy, fun, and light read and I found myself actually enjoying it. Melody was nominated for a Romantic Times Career Achievement Award in the inspi Melody Carlson is the award-winning author of over two hundred books, several of them Christmas novellas from Revell, including her much-loved and bestselling book, The Christmas Bus.